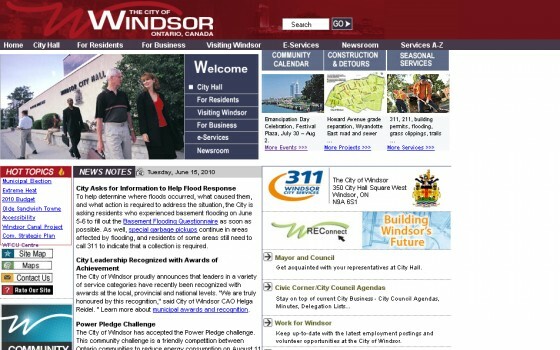 The City of Windsor is readying to move into the Web 2.0 age with a major overhaul and redesign of their municipal website. They need groups of individuals (including those skilled and web-savvy) to participate in a focus group at the end of June that will help to determine a strategic direction for the ailing current early 2000’s design. The City’s Website, at www.citywindsor.ca, has been criticized over the years by various Windsor municipal groups for being outdated and behind in terms of providing RSS Feeds, access to information and for being significantly cluttered. One of the most prominent concerns, echoed by Windsor Municipal Shadow, centres around the availability of public documents in machine-readable formats. While the city puts PDFs of important information online, the process used results in previously printed documents being scanned and placed online as ‘images’. In this way, citing or quoting documents usually results in civic-savvy folks being required to retype everything in a document (including us here at windsoriteDOTca). Two focus groups are scheduled, one on Monday June 28th (10am-12pm) and the other on Tuesday June 29th (2pm-4pm). The focus groups are part of the extensive Service Delivery Review, currently being conducted on a number of City services.